Sri Ramanuja Acarya appeared in 1017 A.D. near Madras, South India in a family of Vedic scholars. Sri Vaisnavas say he was an incarnation of Laksmana. The word Ramanuja means “a follower of Rama.” He received this name because Laksmana always follows and serves His elder brother Bhagavan Sri Ramacandra. A boy of amazing wit, Ramanuja quickly learned Sanskrit, logic, and the Vedas. He took diksa and married at age sixteen. 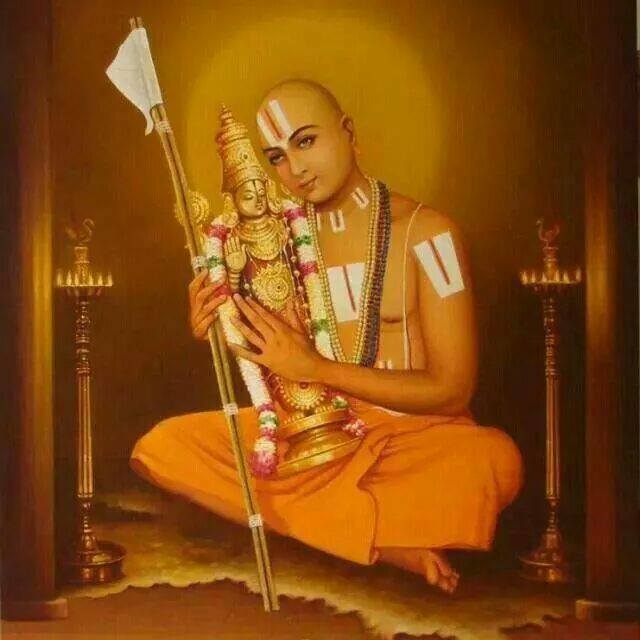 Ramanuja studied with a mayavadi guru, Yadava Prakash, to master mayavadi philosophy and defeat it. When the brilliant Ramanuja kept refuting his mayavadi arguments, Yadava Prakash tried to murder him. Unsuccessful, Yadava Prakash expelled Ramanuja from the asrama. Before leaving, Ramanuja completely defeated his guru’s theory of oneness and no distinction. Sometime later, Yadava Prakash met Kuresh, Ramanuja’s student with a photographic memory. Quoting Srutis, the best of Vedic proof, Kuresh convinced him that Brahman has transcendental form and qualities coming from the ultimate reality the supreme Absolute Truth known as Lord Narayana. Ramanuja initiated anyone regardless of caste. 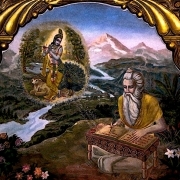 Using the panca samskara purification method, he turned sudras into pure Vaisnavas. He established that the position of a Vaisnava surpasses all social limitations and considerations. Identifying himself as a servant, Ramanuja taught the worship of the Vaisnavas. Several times envious brahmanas tried to poison Ramanuja. To teach detachment to one disciple Ramanuja staged the following demonstration. He told the disciple to create confusion among the sannyasis by switching their clothes at the bathing ghat. When the sannyasis, who were big scholars and renunciates, started wearing each other’s clothes a big argument began. The disciple could plainly see that the “renunciates” were attached to some cloth. Then Ramanuja sent the disciple to the home of his grhastha disciple, Dhanurdasa. Ramanuja engaged Dhanurdasa in the temple to ensure he wouldn’t be home. Following Ramanuja’s order, the disciple began stealing jewellery from Dhanurdasa’s chaste wife, who was sleeping. After the disciple took the ornaments from one side of her body, she suddenly turned over. The startled disciple fled through the window. But he waited outside to witness the reaction of Dhanurdasa. Upon returning home Dhanurdasa talked with his wife. “I’m worried that the temple needs money,” said his wife. “What makes you think that?” asked Dhanurdasa. “Why did you do that?” said Dhanurdasa. Watching all this, Ramanuja’s disciple was astonished at the humility and surrender of these grhastha devotees. Ramanuja explained the meaning of these two events: the sannyasis’ clothes and the wife’s jewels. The sannyasis were so attached to some ragged bits of cloth that they fought over it. But the grhasthas were detached, even from costly jewels if they were needed for Krishna’s service. Ramanujacarya founded the Sri Sampradaya, one of the four major Vaisnava sampradayas (Brahma, Sri, Kumara, Rudra). This sampradaya propounds the Vedanta philosophy of visistadvaita vada, qualified monism. Both accept three classes of jivas: eternally liberated, forever bound, freed by devotion and sadhana. Ramanuja taught serving God in Vaikuntha with awe and reverence in dasya rasa(mood of master and servant). Gaudiya Vaisnavas teach confidental service in madhurya rasa to Radha Madhava within the groves of Vrndavana. Ramanujacarya wrote many famous commentaries on the Upanisads, Puranas, Bhagavad gita. Sri Bhasya, his commentary on Vedanta, presents a formidable challenge to Sankaracarya’s impersonal commentary. To this day, the Sri Vaisnava disciplic succession from Ramanuja continues to uphold the traditions of deity worship and philosophy systemized by the founder. His samadhi is in Sri Rangam.